than to the cover art. Warning: this is another dungeon, so potential players who don't want the surprise ruined should stop reading here. 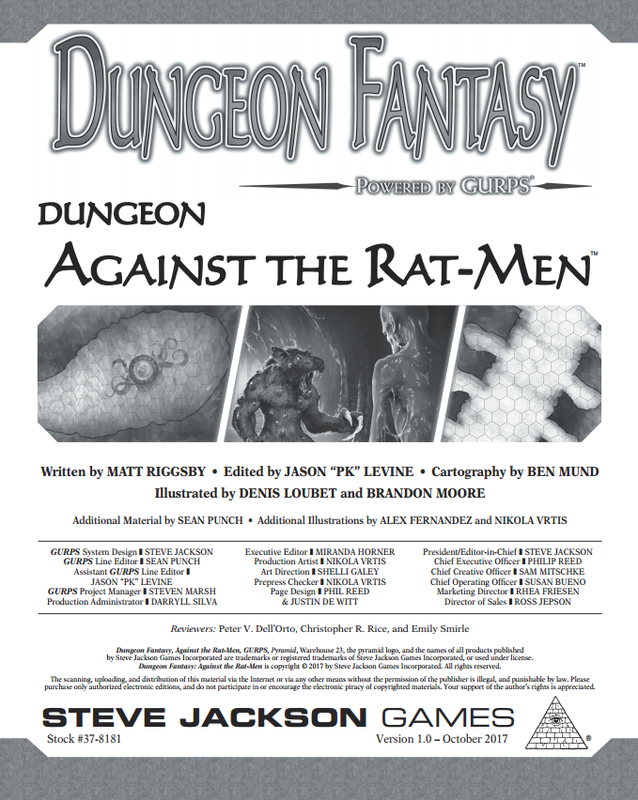 This is the last book of the Dungeon Fantasy RPG content, besides a few pack-ins for the GM Screen, which I will save for when that actually arrives. Really, there isn't a lot I need to say about this dungeon that I didn't say about the other. It's decent and simple, and has a lot of guidance for new GMs. The cool thing here is that this is a bit of a sequel to the other dungeon, so if you like continuity, that's a nice bonus. So, let's take a closer look then. Usually, I go by these books, paragraph by paragraph, but the approach doesn't seem to be the correct one for adventures, so I'm doing this all as one chunk. This is a 26 page supplement mostly consisting of an adventure, and a few extras in support of running said adventure. Subtracting The title page, table of contents, the introduction, and some ads tacked on at the end, we are looking at 21 pages. The adventure is a sequel to the one that comes in the boxed set proper, but as explained in the introduction, it is easily tailored to be run on its own. It's meant to target slightly experienced Dungeon Fantasy characters, but to me, the encounters seem easy enough that the perfectly synergized team of new 250 point characters, played by modestly experienced GURPS players can also probably get through it fairly successful. That said, I prefer to look at this more as a kind of aid for new GMs and new players to get a handle on the flow of things, a perspective on how one designer feels about some of the more subjective elements like balancing challenges and rewarding loot (I feel, for example, my monsters are generally more dangerous, my traps are less dangerous, and I give out more treasure, but less points; not that one way is more correct. It's just an interesting observation to me,) and looking at the things you might want to keep in mind when preparing a dungeon or adventure. The book is split into three chapters. The first, 2 pages, is about how to hook the party into the adventure. The second, 16 pages, is pretty much the adventure proper. The final chapter, 3 pages, is kind of the conclusion and deals with rewards, how the players can wrap up the adventure, and the like. 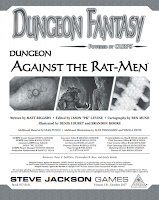 In comparison to the other two Dungeon Fantasy adventures, this is longer than I Smell a Rat, but shorter than Mirror of the Fire Demon, and falls roughly between the two in difficulty as well. As an instructional tool and as a self contained adventure, it is pretty good at what it is. 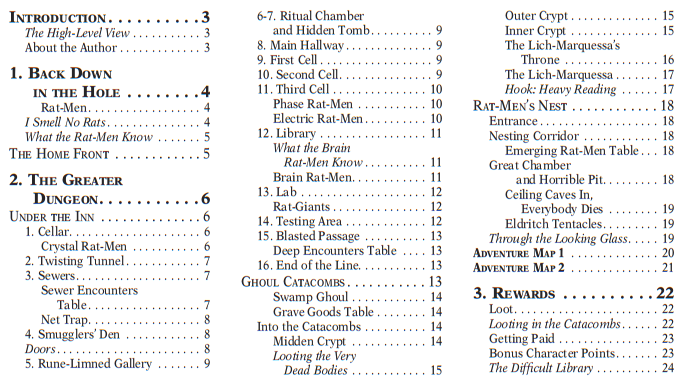 As for reusability outside of the adventure, there are a handful of monsters (not particularly interesting in my opinion except that they illustrate the 'variations on a theme' idea nicely which is spoken to in Dungeon Fantasy RPG - Monsters) and there are no especially interesting unique treasures, though the Grave Goods Table is an interesting way of showing how to set up random treasures for a dungeon if that is something that you like. Having a few adventures with a couple of consistent NPCs though is a good way to establish a potential hub from which adventurers might continue having some more adventures for a while. Overall, this is an interesting adventure, and I might want to run my players through this and the previous one somehow, but I'll probably need them to either build brand new characters or buff a few of the monsters to make it a little more risky.